Huski (www.hu.ski) report a 300% increase in food delivery bookings this winter season compared to Winter 17/18 and enter the last few weeks of this season with some fresh NEW Savoyard produce available. In addition, for the last three weeks of the winter season Huski are offering up to 40% off online food bookings for deliveries across the French Alps. 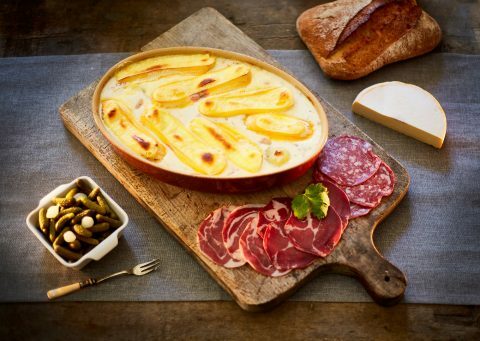 In time for the last few weeks of the ski season, Huski launch their locally-made Savoyard range – with restaurant quality dishes made in their Bourg St Maurice kitchen by Chef Nick Casey – including Tartiflette, Boeuf Mondeuse and a range of soups. This new range compliments Huski’s core range of COOK dishes, but with the addition of the well-loved ski dishes – with local recipes and locally sourced ingredients. Also NEW THIS SUMMER, in response to a surge of interest in self-catered Summer holidays in the Alps, Huski will continue to deliver across all resorts in the French Alps. To cater for the more health-minded cycling and hiking crowd Huski are adapting their range with a greater selection of light and fresh options. In addition Chef Nick will be launching a new range of delicious vegetarian and vegan options ready for the summer season as well as winter 2019/20. Paddy Griffith adds, “We are so excited about our new Savoyard Range. All winter we’ve been in the kitchen perfecting recipes and gathering feedback, and we are now ready to offer three cracking dishes this summer and by next season a complete week’s menu. They work super well alongside our ‘COOK’ line-up and will make summer holiday dining a breeze. And if in the Tarentaise, customers can also stop by and pick up their orders”. Huski are launching a new offering for large groups and event organisers. Huski Groups is the perfect solution for feeding large numbers of people on a budget, with a flexible range of food and drinks, designed and delivered for minimal complication. Huski Groups is being rolled out for Winter 19/20 with a number of University Ski Trip and Festival organisers. The range has been designed by Huski Head Chef Nick Casey, working out of Huski’s NEW kitchen facility at their Headquarters in Bourg-St-Maurice.